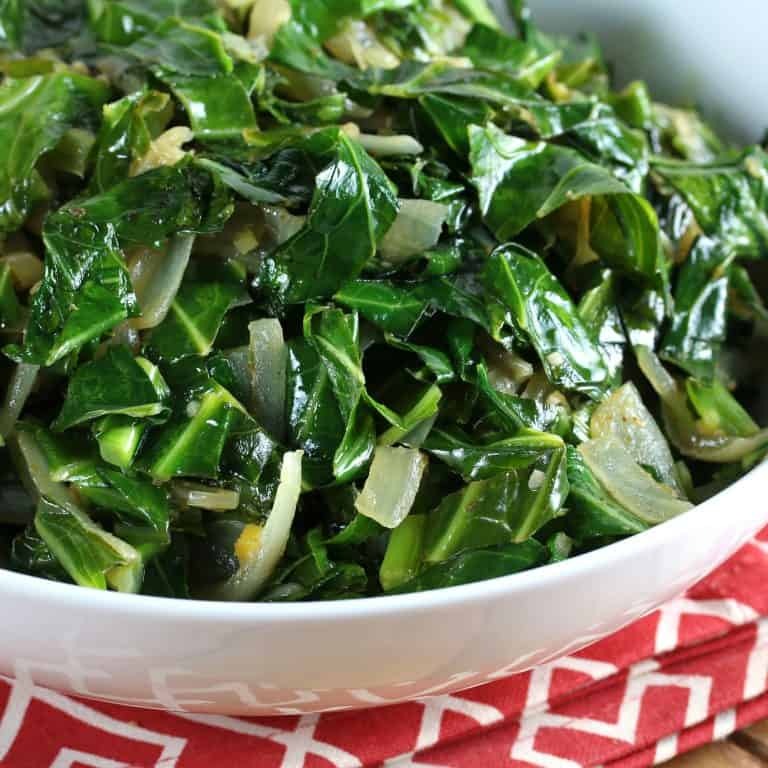 This authentic Ethiopian side dish takes eating healthy greens to a whole new level of deliciousness! 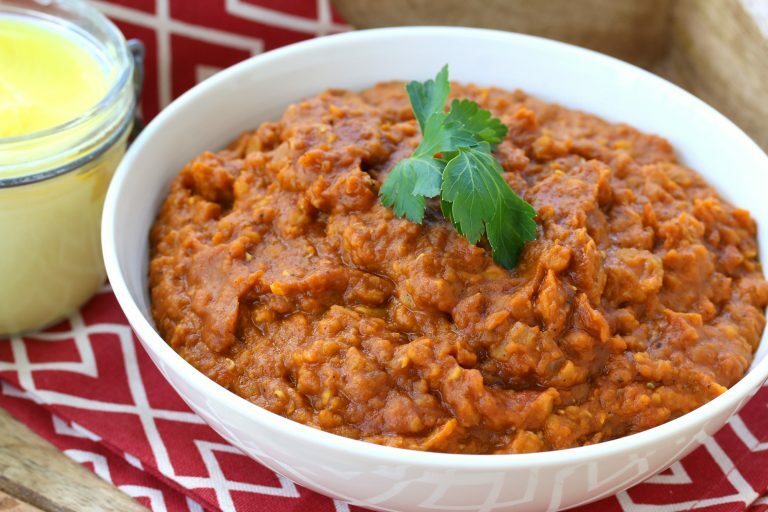 If you’re looking for an authentic Ethiopian veggie side dish to serve with your Ethiopian entree, Gomen (aka Ye’abesha Gomen) is among the most popular and delicious. 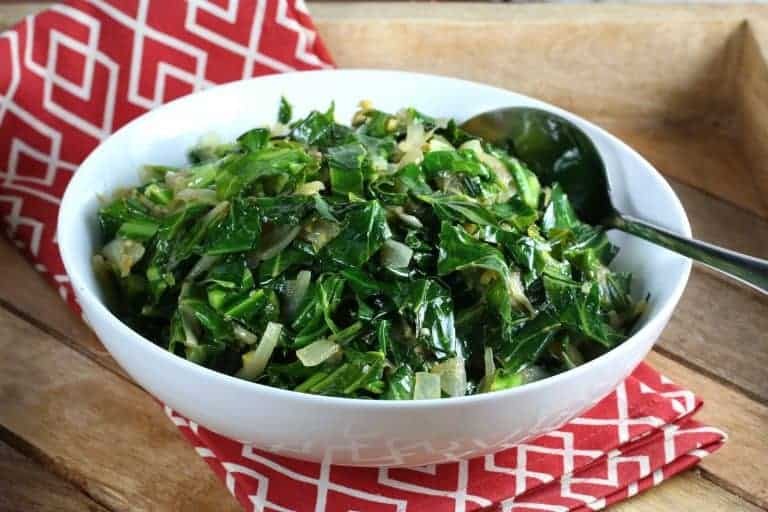 Or if you’re simply looking for a wonderfully flavorful way to enjoy those healthy greens, look no further. 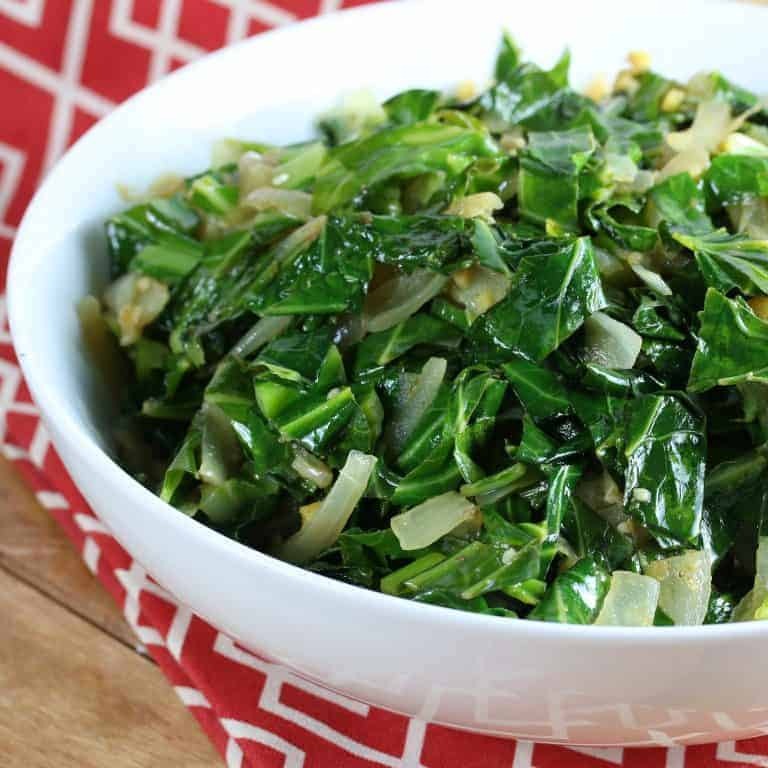 Gomen is traditionally made with collard greens but kale works equally well. You can also use spinach but I prefer the crispiness of the collards or kale. 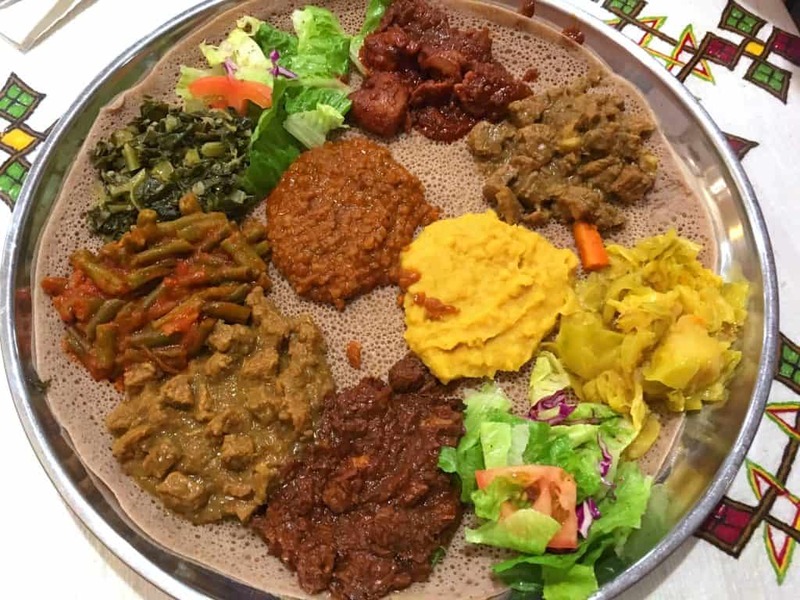 This traditional Ethiopian side dish can be found in most Ethiopian restaurants and pairs wonderfully with any number of Ethiopian meat and vegetarian dishes including doro wat, sega wat and misir wat, to name a few. Above picture: The gomen is in the top left corner of the platter to the left of the lettuce. A variety of Ethiopian dishes are commonly served for a meal and instead of serving them on a plate are served on injera, Ethiopian flatbread. 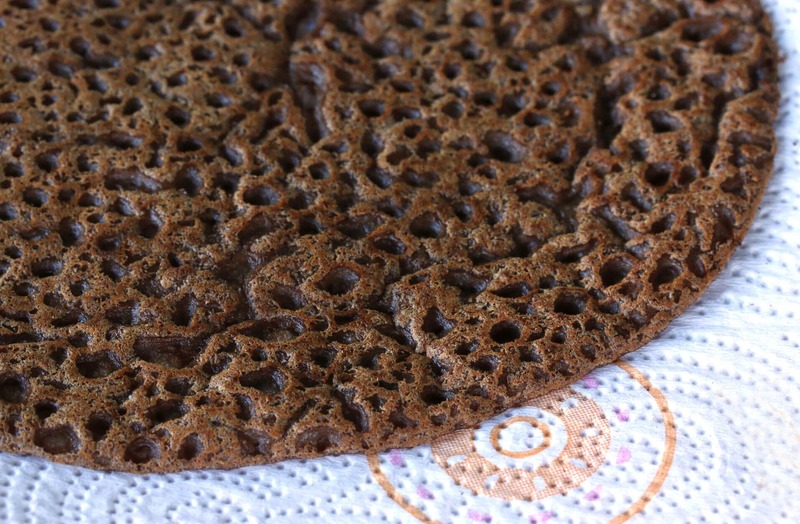 Additional injera is served on the side and pieces are torn off and used as utensils to scoop up the food. To make Ethiopian Gomen you need an ingredient called niter kibbeh, which is an Ethiopian spiced clarified butter. 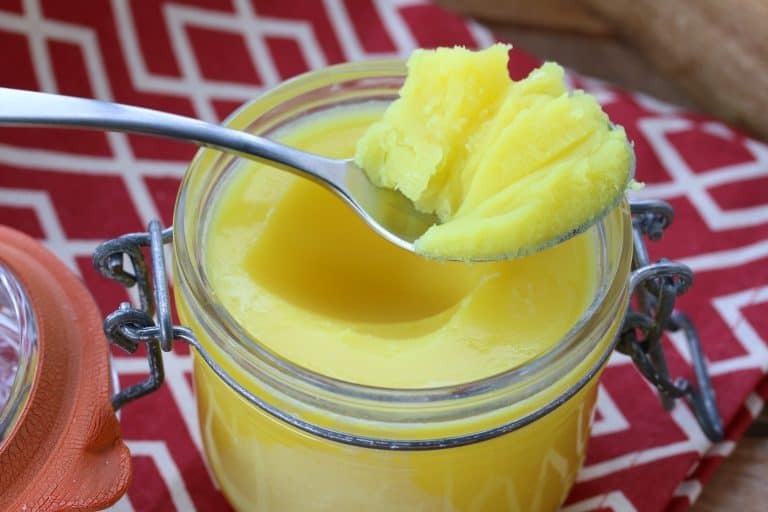 It is made using the same method as Indian ghee in which the butter is heated and the butterfat is separated from the milk solids. Niter kibbeh is infused with a variety of fragrant herbs and spices resulting in a clarified butter that is highly aromatic and flavorful. Niter kibbeh is an essential ingredient in Ethiopian cuisine, including Gomen, and there are no adequate substitutes. Niter kibbeh is extremely easy to make and keeps for several months in the fridge. While you can buy niter kibbeh online, nothing compares to the flavor and fragrance of homemade. Check out our recipe for Authentic Niter Kibbeh (Ethiopian Spiced Clarified Butter). 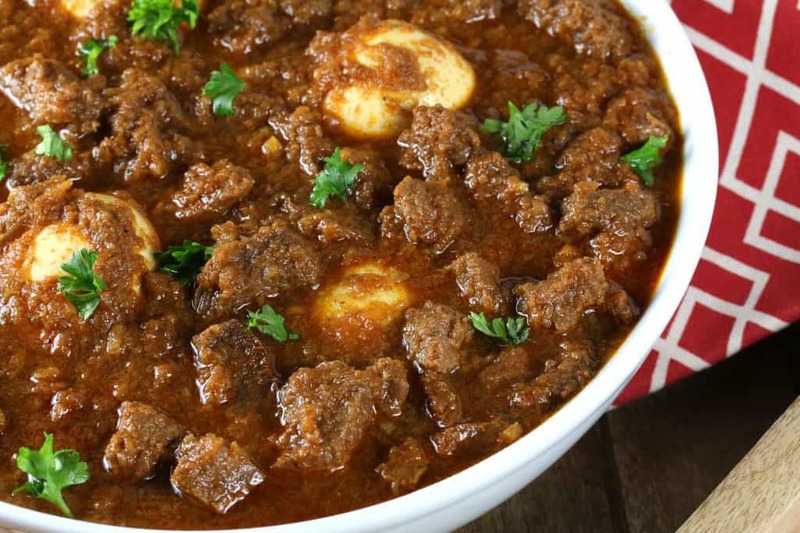 Be sure to try these other authentic Ethiopian dishes! Okay, let’s make that Gomen! Heat the niter kibbeh in a pan over medium high heat. Add the onions and cook until soft and translucent, 5-7 minutes. Add the garlic, ginger and spices and cook for another 2-3 minutes. 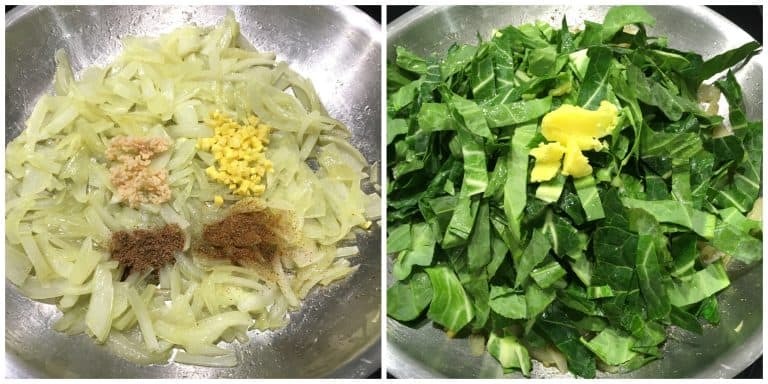 Add the collard greens and another tablespoon of niter kibbeh and cook until the collards turn bright green and are wilted but still slightly crispy, 5-7 minutes. Add more spices and/or niter kibbeh to taste. Heat niter kibbeh in a pan over medium high heat. 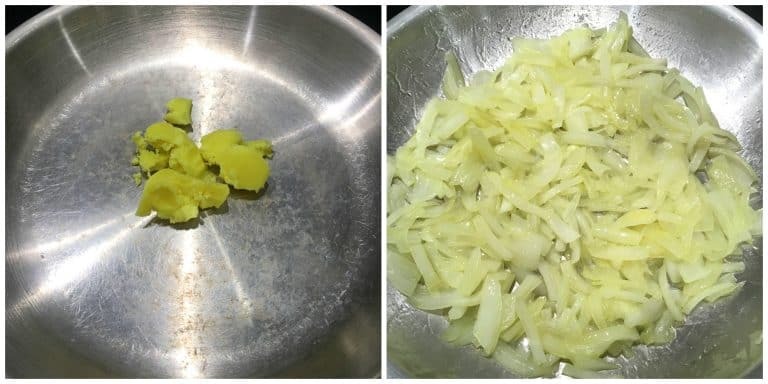 Add the onion and cook until soft and translucent, 5-7 minutes. Add the garlic, ginger and spices and cook for 2-3 minutes. Add the collard greens and another tablespoon of niter kibbeh and cook until the collards turn bright green and are wilted but still a slightly crispy, 5-7 minutes. Add more spices and/or niter kibbeh to taste. I think this is how I would love to eat collard greens! Love the spice mix! Looks absolutely awesome! This is my kind of side dish, adding to my list of must makes! Are you able to tell me exactly what Collard means, in this context, please? It is a word that I have been unable to get a handle on for many years! Where the term “collard” comes from I don’t know but they’re in the cabbage family. They’re large loose leaves, similar to kale. Yes, collards have often larger leaves if you compare them to kale at a market’s produce section. 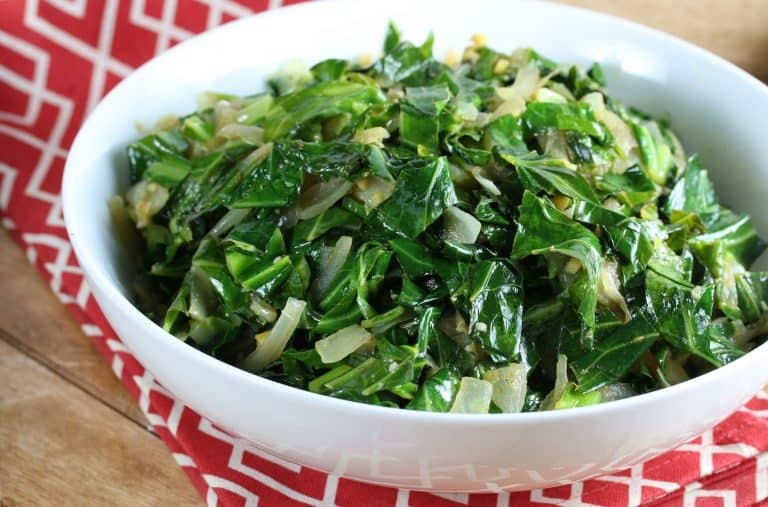 The best time to buy collard greens is in the cool season. 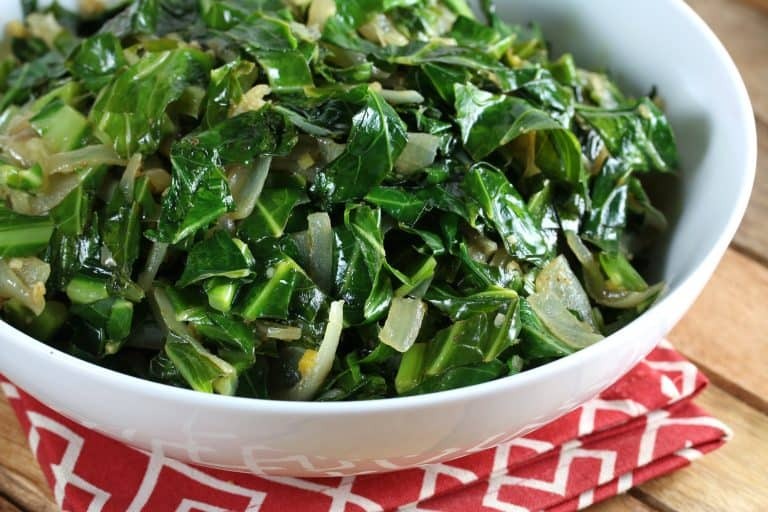 It’s at this time of year that collards and other greens are at their sweetest. If still in doubt, the produce personnel can guide you to what you’re looking for. Should you find kale enjoyable, try growing your own for amazing freshness and flavor. Hi Linda, definitely, we grow our own greens every year (kale, collards, Swiss chard, spinach, etc) and the flavor and nutrition are vastly superior. I am so excited to try this recipe! It looks delicious, and I love the vibrant color of the greens! Bring on the greens! These look so good! Do you reckon I can use two teaspoons of berbere instead? Its just I have loaaads of berbere left from when I made your delicious misir wat recipe, so would like to use that instead! 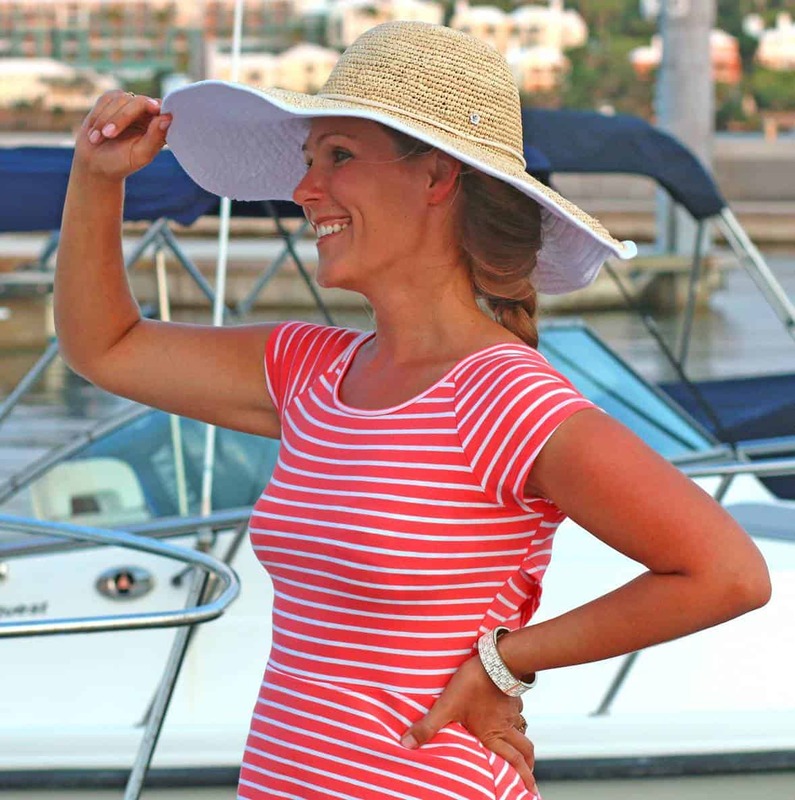 Absolutely, Nina, berbere is perfect! Thank you for posting this! I think I requested it a few weeks ago. 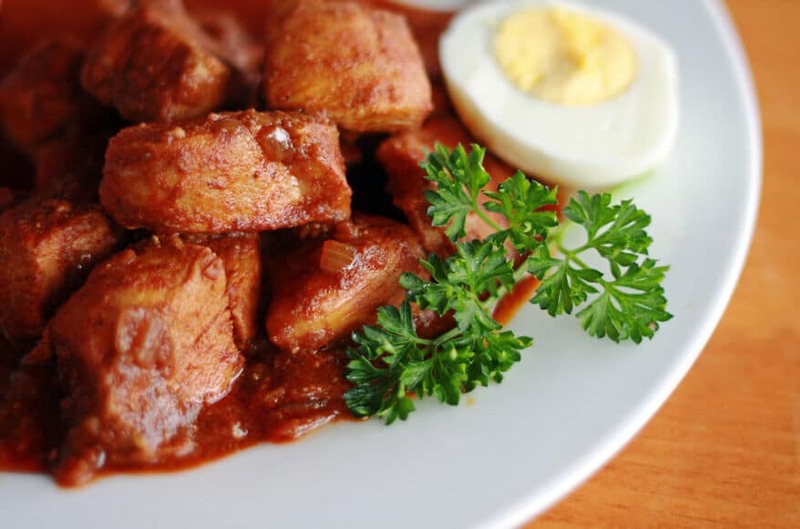 Making Doro Wat tonight so will make Gomen to go with it. You are fantastic!! You sure did, Monti, you’re welcome! :) Hope you enjoy both the doro wat and the gomen!